A mega-scale fold is exposed near Jeddah city in the western-central part of the Arabian Shield. This fold extends NE for about 35-km long and 12-km width and occupies the northwestern block of a distinct linear feature known as Ad-Damm Shear Zone. It is composed essentially of foliated, sheared, and mylonitized metamorphic and plutonic rocks. Para and ortho-gneisses were an amphibolite facies condition whereas greenschist facies units were represented by metasedimentary and metavolcanics. Image processing and field-based structural analysis, in addition to micro structural investigations of the mega-scale fold, indicating that the ductile dextral-sense of shear was overprinted by a brittle regime associated with the evolution of Ad-Damm shear zone. The Ad Dam mega-scale fold is a shear-related structure, north plunging overturned anticline. Mylonitization and dextral shear-related structures were developed during a transpressional regime. The Ad-Damm fold is a structural system that illustrates the evolution history of the Arabian Shield associated with the development of the NE-wrench fault. This fault started as an early plastic followed later by a brittle tectonic regime. 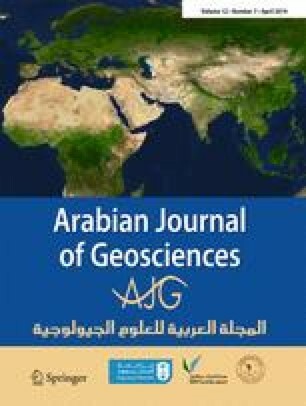 The present study indicates that Ad-Damm shear zone and several sub-parallel dextral shears of NE-trends which located in the western side of the Arabian Shield represent a conjugate antithetic shear to the NW- trending sinistral shear of the Najd fault system. •Ad-Damm Shear zone is a brittle-ductile structure developed during a transpressional regime. This project was funded by the Deanship of Scientific Research (DSR) at King Abdulaziz University, Jeddah, under grant no. 460-145-34. The authors, therefore, acknowledge with thanks DSR for technical and financial support. We thank Dr. Nabil El-Masry for his kind revising of the early version of the manuscript. Dr. Abdelhamid El-Fakharani, and Dr. Kamal Ali are acknowledged for fruitful discussions. The guest editor Dr. Sami Khomsi, and the two anonymous reviewers are acknowledged for their constructive comments and suggestions which greatly improved the manuscript.